Many of our weekend clients are home school families and they've been asking us to put together a weekday program for years. So, we finally did it. We designed this program as a daytime learning activity for children ages 5 to 18 who do not attend traditional public or private school outside of the home. Parents are encouraged to stay and attend classes with their children, but it is not required. 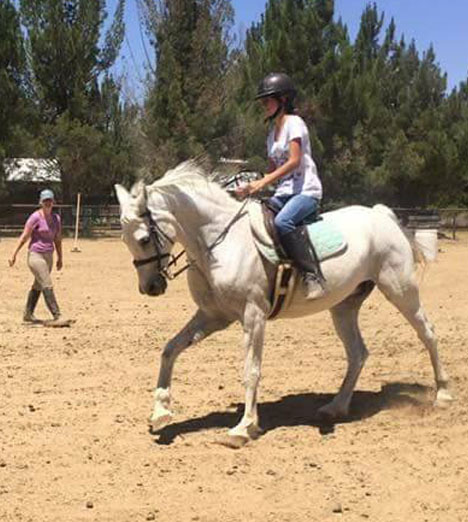 Typical classes are an hour long, with a focus on learning about horses, both on the ground and riding. 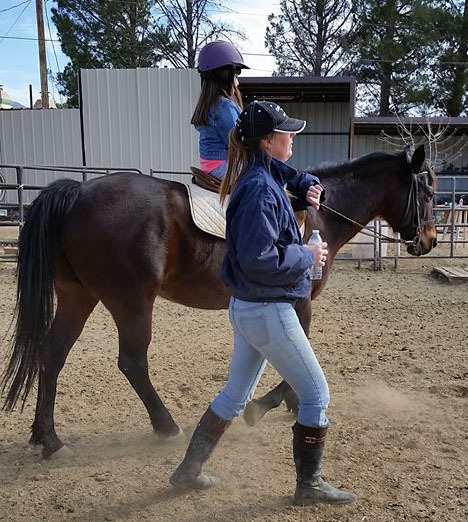 Two of our three instructors are working on Master's Degrees (in Social Work and ABA/Psychology, respectively), and, with 50 years of combined riding experience in all disciplines, they are well equipped to work with children at the barn. We'll work with parents to design a curriculum that is appropriate, fun and engaging for your child, and we are available up to four times a week, as your budget and schedule allow. If you have specific academic objectives, equitation objectives or if your child has special needs, please let us know. Our home school program is not designed to accommodate children with profound disabilities (we have other programs that may be), but if your child has extra challenges, we will evaluate them on a case-by-case basis to see which of our programs is most appropriate. 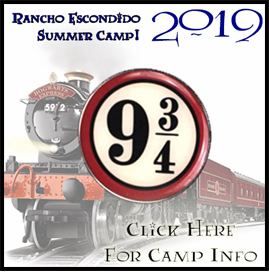 Please note: Rancho Escondido is a 501(c)(3) non-profit, Public Charity and we do not discriminate (or tolerate discrimination) against people of all faiths or no faith, people of all races, abilities, nationalities, creeds and gender, and people of all sexual identities. Our facility is open to ALL people of ALL abilities. Our Home School Program is generally in a group format, with one or two instructors. This means that we'll typically have three riders and one instructor in the arena at one time. We will never have more than four beginning riders at one time. It is our experience that children typically learn better this way, but if you would prefer a private 1:1 lesson, talk to us and we can arrange it. Please make sure that your child wears long pants (jeans) or riding breeches and a closed toe shoe. Sneakers are ok, but not great. Some sort of boot (with a heel) is preferable. Dress for the weather. Riding Helmets: Riding helmets are mandatory for all students. There are no exceptions. If you have an approved Equine Riding Helmet, please bring it. If you do not, we have plenty. We understand that some children with specific disabilities do not like the "feeling" of having something on their head. Please work with your child in advance using a ball cap or other hat. We cannot make any exceptions to this rule. Generally speaking, an hour-long lesson is $35.00, paid monthly in advance. Discounts may be available for families who sign up for more than 3 lessons, M-F. (e.g., one child, 3 lessons, 3 children, 1 lesson, etc.). Important: Our weekend lesson program is a different program, with different instructors and different objectives. Home school discounts do not apply to weekend lessons, and visa versa. Free Ride/Drop Off is $35/hour. We have 10 horses to choose from at the barn, each with their own training, their own temperament and their own style . We understand that riders sometimes develop a bond with one specific horse. But, if your child spends every single hour at the barn riding one specific horse, they will only learn to ride that one specific horse, not horses in general. 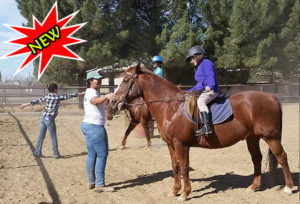 We currently have four solid beginning level horses, and we cannot guarantee which one your child will ride. In fact, we'll probably mix it up a bit, specifically so that your child gains exposure to different horses. Both our weekend riders and our home schoolers are invited to join us at any of the community riding events that we attend. We have a four-horse trailer, which limits the number of horses we can take, but we love going to Gymkhanas (amateur rodeo games) and English Eventing competitions. We go to these events to have FUN. There is no competition, we don't have a formal "team" of riders -- everyone is invited. We do not charge for your children to come to any extra-curricular events, but, in most cases, the venue will have event and/or entrance fees. These are your responsibility. Weather: We ride in an outdoor arena. If it rains, or if has recently rained, the arena may be too slippery to ride. Similarly, extreme heat, cold and wind make for a miserable (and potentially dangerous) day for both horse and rider. If we have to cancel due to weather, we will notify you as early as possible, and reschedule your lesson or refund you. Your Responsibility: If you do not show up within 15 minutes of the start time of your lesson, it will be cancelled, with no refund. Our instructors have to get here, clean stalls, drag the arena and saddle the horses. If you do not cancel 24 hours in advance, there is no refund for missed lessons. Contact us and tell us about your student! 2. Download the Registration Form Here. You can fill it out with Acrobat Reader. Print it, sign it, and bring it to your first lesson. You're welcome to bring your child in for a lesson during school hours. We ask that you give us 48 hours notice so we can make sure to have the right horses and the right instructors available. We'll evaluate your child's riding level and match them up with an appropriate horse. Available Monday - Friday, 9:00 AM to 4:00 PM.